Be more productive with our best mower conditioner yet. 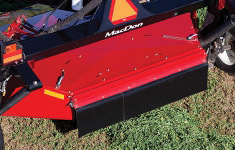 In our never-ending quest to perfect the harvesting experience, MacDon offers the latest advance in hay and forage harvesting – the MacDon A30-D Pull-Type Mower Conditioner. 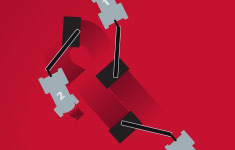 Incorporating MacDon’s extensive harvesting knowledge and experience, we’ve optimized this double knife drive machine’s performance at every contact point with the crop. This has significantly improved overall cutting and conditioning performance and provided an increase in ground speed over previous MacDon Mower Conditioners. The A30-D’s design improvements are extensive and include adjustable conditioning, a new heavy-duty cutterbar design, a double knife drive system and a beefed up, easier to attach hitch. The result is a commercial quality machine that the high acreage producer can depend on to get the job done while maximizing the nutrient value of his crop. 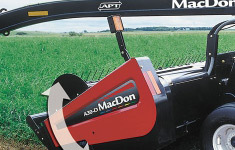 MacDon’s APT hitch allows you to pull the machine on either side of the tractor for back and forth harvesting. 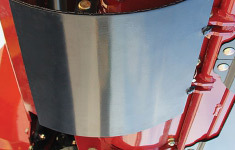 The vertical pivot has been moved back from the tractor to significantly reduce turning radius and make it easier to open fields. To improve conditioning performance, the R85 Rotary Disc and A30-D pull-types have been equipped with the widest steel on steel rolls on the market (102″/2591 mm on the A30-D; 118″/3000 mm on the R85). 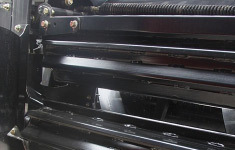 Wider rolls result in a thinner mat of material passing through, which increases the amount of crop in contact with the rolls, improving crimping performance and ensuring thorough conditioning of the plant stem. 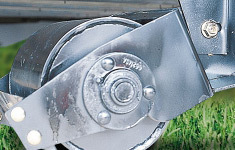 These conditioning rolls also feature a design which more aggressively pulls crop away from the cutting discs and feeds it into the forming shield, for reduced power requirements and improved performance in both light crop conditions such as grass and heavier alfalfa type crops. 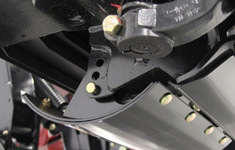 The adjustable Outboard Skid Shoes are standard on the A series mower conditioner. They are built with a double steel skin fo durability in tough field conditions. We’ve made the cutterbar super strong by giving it a Z-shaped profile and incorporating a rectangular reinforcement. 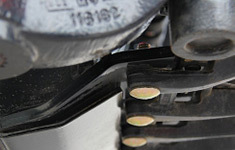 As a result the cutterbar is much stronger along both the horizontal and vertical planes, allowing it to better withstand impact from field obstacles. Like all MacDon harvesting machines, the A30-D is designed for the toughest conditions. Exceptional durability of the unit is assured by the heavy-duty cast housing of the dual wobble boxes and rugged internal components of the knife drive system. 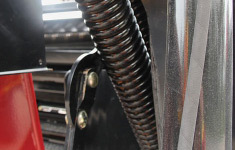 The A30-D’s independent suspension system features heavy duty flotation springs (shown) which allow the header to react quickly and smoothly to ground obstructions, reducing the likelihood of damage to the cutterbar and knife components. 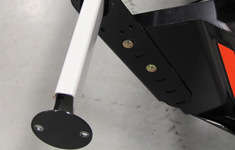 A very convenient storage location is built into the front lean-bar. The A30-D’s wide 31 x 13.5 – 15 tires provide smooth flotation over uneven ground and a light footprint – an important advantage in soft soil conditions. 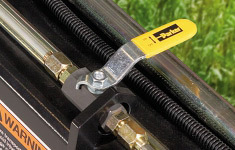 Stub guards mount directly to the cutterbar to improve cutting performance in tough, stringy grass type crops, and crops that need to be cut close to the ground (such as grass, hay and rice). Kits can be ordered based on size of product. MacDon skid shoes (16’/4.9 m model shown) operate in different positions to allow for cutting in rocky conditions (three positions on 16’/4.9 m, two positions 13’/4 m). This higher ground clearance allows for excellent rock protection. The A30-D comes with manual or optional hydraulic guard angle adjustment allowing you to easily switch between close cut and longer stubble cutting lengths. 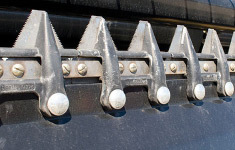 Attached behind the cutterbar to reduce wear on the cutterbar wear plate and improve the movement of the header over uneven terrain, as well as in sand or firm soil conditions. 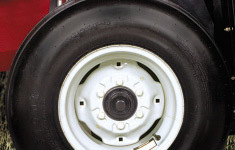 Optional for A and 16′ R Series.